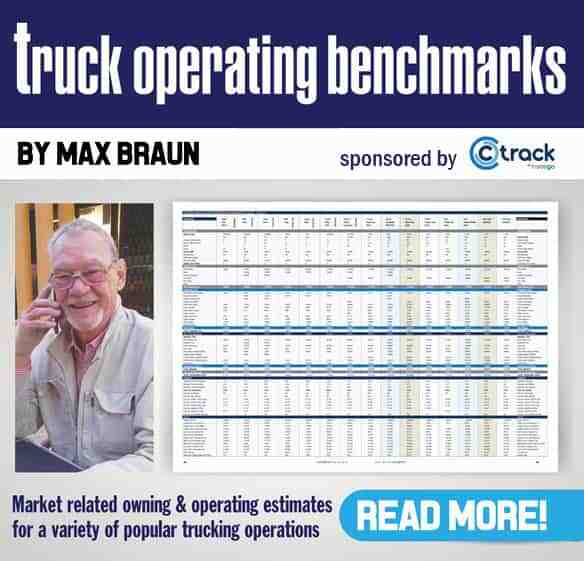 Readers of FleetWatch and regular followers of the Operating cost Benchmarks (OCB) are aware of the efforts we make to keep the benchmarks realistic and market related. This mid-year review and update of the various cost drivers that make up the standing and variable costs is based on extensive discussions with various suppliers, service providers, transporters and fleet owners as well as reviewing variety of transport and related statistical sources. The outcome of these discussions and reviews reflect the depth of the ongoing recession and presents a unique situation that this writer has not encountered at any time since the FleetWatch operating cost benchmarks were first published in July 2003 or indeed at any time in the past 50 years. The uniqueness we are experiencing is evident in the rising cost of transport operations while the prices of vehicles, equipment, replacement parts and tyres are almost static. This is partly due to the weakness of the US $ and the Euro. However, driven by fierce competition prices across the board have hardly moved this year when compared to at least the second half of 2009 and in some cases have slipped back by about 3%. Vehicle manufacturers, trailer and body builders as well as allied equipment suppliers such as mobile fridge units say the level of competition has defeated any opportunity to increase prices. There is also a shortage of stock, especially popular models thanks to the recent Transnet strike. According to vehicle manufacturers and some dealers new vehicle purchases has been by large fleet owners, only meagre sales to smaller and medium size fleets have taken place this year so far. Whether it is the sale of vehicles, trailers or fridge units, retained gross profit, when selling to large fleet owners, is minimal, especially after accounting for the impact of increased rates, electricity and labour costs. With a distinct slow down in demand for insulated bodies and trailers some suppliers are feeling the strain. The banks say business is a bit better than late last year; however, balance sheets are under still pressure even large fleet owners need to increase their equity when replacing or adding vehicles and equipment to their fleets in order to secure funds at a sustainable rate. Interest rates came down 500 base points earlier this year and have remained at 10% ever since. Insurance premiums have also gone softer reflecting similar levels of intense competition among short term insurers and some re-insurers. According to some insurers specialising in the business of transport premiums can be as low as five percent of value. It is highly recommended that the value be based on replacement value and not market value. Once again the advice to all transporters using conventional insurance is to make sure the cover they pay for is adequate and deliverable. Be aware of the high incidence of accidents, the fact that less than 25% of road users are insured, that there is almost no barriers to entry into the industry and the less responsible insurers and transporters are using insurance excess to facilitate cash strapped players. Drivers’ wages went up by 9 to 11% this year. Based on recent wage demands and the militancy of the unions it is reasonable to expect to serous bargaining later this year or early in 2011. Fuel price volatility is expected to remain due to the fluctuating Rand, the weak US$ and the impact of Deep Water Horizon’s on world opinion and US government response. What more can speculators ask for to drive the price of fuel at the pump? Once again let’s keep our focus on how efficiently we use fuel. Maintenance contracts are also being discounted in a bid to get operators back into dealer workshops. Newcomers need to read the fine print to understand the exclusions and other consequences of driver abuse and neglect. Many transporters and fleet owners voice concern at rthe growing incidence of Chinese replacement parts being used by franchise dealers and the high cost of parts generally. In summary, the challenge for transporters and fleet owners regardless of size is not so much about freight rates. It is more about transporting sufficient volume and covering sufficient kilometres to cover costs and make a return. Presently the market has too many irresponsible operators who flaunt the laws and do not get picked up by generally poor performing law enforcement agencies. Too many shippers and consignees appear to have scant knowledge of transport costs and make unreasonable demands often to their own and the transporters detriment. Due to this unique situation the FleetWatch operating cost benchmarks, other than the latest fuel price remains unchanged until November this year when it will be reviewed again. The benchmarks will be updated to accommodate any change in the price of fuel whenever that takes place. Welcome to the FleetWatch Truck Operating Benchmarks 2010. 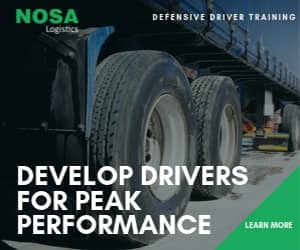 The schedule covers a variety of typical primary and secondary distribution trucking operations.The objective is to provide operators and shippers (consignors) with a reliable independent guide to trucking costs incurred in the transportation of raw materials, semi-finished and finished products. A thorough understanding of the assumptions and how they are applied in developing the benchmarks is necessary if the various elements are to be informative, beneficial and helpful. While FleetWatch takes no responsibility for the accuracy of the estimates, considerable time and effort has been expended to ensure the various components are realistic and representative of the hypothetical transport tasks contained in the schedule. Updated estimates are published quarterly. However, the schedule is continuously monitored and updated monthly. Many transport tasks are similar, but few are ever identical. The benchmarks are based on average operating conditions in terms of demography, roads, annual kilometres, working days, vehicle capability, scheduled maintenance in accordance with manufacturers’ recommendations and competent drivers. Where actual operating conditions differ from these assumptions, make the necessary adjustments to the benchmarks so that they remain realistic, market related and applicable to your trucking tasks. Briefly describes the vehicle configuration contemplated for a specific task (eg , 4×2 rigid freight carrier with volume van body for medium distance secondary distribution of FMCG products). The descriptions attached to articulated vehicles indicate the number of axles. (1.1.3 means a 4×2 truck-tractor and tridem semi-trailer. 1.2.2 means a 6×4 truck-tractor and tandem semi-trailer are examples). The assumptions are based on typical optimal legal mass payloads that can be achieved on any number of vehicles, bodies and trailers freely available on the local market. In practice the actual payload will depend on the vehicle manufacturer’s specification and the road-ready unladen mass. Lightweight trailing equipment can improve payloads. The assumption contemplates 1000 x 1200 mm 4-way entry pallets. Cubic assumptions are based on length, width and height of typical van bodies applicable to the various operations. In practice this varies with measurements of specific bodies. Annual kilometres are based on typical operations. Annual kilometres of vehicles engaged in short and medium distance secondary distribution vary considerably. The schedule includes two examples to illustrate the impact of annual kilometres on standing costs (see the 1.2.2. and 1.2.3 benchmarks). Space limitations prohibit the inclusion of a wider variety of such examples. A five-day week is assumed for the vehicles most likely to be involved in secondary distribution. Larger rigs often work longer hours to meet the demands of primary distribution. Shifts indicate the average daily working hours of fridge units. assume the useful life to be the number of years required to cover the estimated cumulative kilometres for each task with a maximum of 800 000 km (where applicable). A 5-axle articulated rig (1.2.2) covering 100 000 kmpa has an assumed useful life of eight years is an example. See comments under depreciation for more detail. The useful life of the major components is an important element in achieving cost effective transport when planning fleet size for medium- and long-term contracts. All estimates are based on the cost of new vehicles and trailing equipment. The indicated initial cost of vehicles, trailers, bodies and auxiliary equipment (such as fridge units) is based on the average of published current selling prices of such items, less known fleet discounts. Vehicles , 20% a year over five years. Auxiliaries , 25% a year straight line. Trailers , 10% a year straight line. Tyre values are not deducted from the initial price of vehicles and trailers prior to depreciation. It is important to remember that in terms of the IRS the useful life of vehicles and equipment must be assessed at least annually and revised to accommodate any significant changes that may have occurred to lengthen or shorten the useful life or diminish the ultimate residual value. For those interested read accounting codes AC123 and AC128. “There’s no free lunch’ as the saying goes. Interest on the cost of vehicles and equipment is calculated at the prime bank overdraft rate on the capital cost less an RV of 30%. The calculation indicates the average interest, paid per annum on the reducing balance over five years. Licence fees for vehicles and trailers are based on the current Western Cape tariff, the most expensive vehicle licence fees in SA. Insurance cost assumes the operator has a low risk rating. Premiums are set at 7% of the purchase price (replacement value) for vehicles, equipment and trailers. Driver and assistant wages vary considerably across the country in terms of vehicle size, primary and secondary distribution tasks, region, different operators and the structure of remuneration packages. All assumptions include an allowance for company contributions but exclude overtime and bonuses. Where applicable an assistant has been included as a casual, daily worker. takes into account an assumed maximum power demand of between 55% and 60% when expressed as a percentage of maximum available kW/hrs for each task. A similar approach is used in calculating the fuel used by fridge units. The price of fuel is based on the pump price in Gauteng for diesel with 3% or less sulphur content. Bulk rebates are ignored. Is based on five per cent of the fuel cost. The assumed cost of maintenance is based on current vehicle manufacturer and FML maintenance contract rates, expected economic component life and industry experience. The assumptions take into account the complexity of each task including typical operating conditions such as roads, topography, traffic density etc. Repair and maintenance costs for fridge operations are calculated in hours. Tyre life is based on typical casing life currently experienced in the various operations. Major tyre supplier tyre management programmes offer excellent data to establish achievable tyre performance. The estimates do not include toll fees, vehicle tracking, engine protection or other optional equipment. No allowance is made for administration or overhead expenses. The variation in operator approach to such costs excludes the inclusion of a sensible amount to cover these aspects as a typical benchmark. The summary expresses operating benchmarks under numerous headings including tons, ton/km, pallets, pallet/km and metres of deck length. It is important to note that all calculations assume a fully loaded vehicle. Management ratios provide an excellent insight into the high capital and operating cost of vehicles, especially when not properly managed. However, correctly selected vehicles that are decently driven and timeously maintained offer cost-effective transport to shippers and the prospect of a commercially acceptable return for the operator. The FleetWatch truck operating benchmarks offer shippers and operators the opportunity to fine tune these estimates to suit their specific transport operations or needs. Where particular elements differ from your operations, simply make the necessary adjustments. If, however, you require more information to complete your benchmarks, contact Max Braun at maxbraun@iafrica.com for some assistance.